hi i put a link to your blog on my blog. i really love it. this is denise from crochet links by the way. Great pattern. Quick and easy. Those are the cutest. Thanks for sharing. 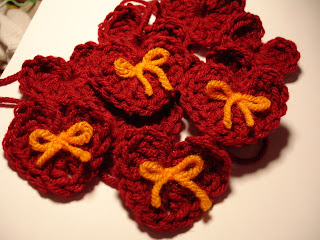 I teach teenage boys crochet, and I wanted them to make these hearts. Unfortunately, I forget the pattern, but as I did 16 of them earlier in the day, I went around and verbally taught them. Not all the boys were at the same speed, so I went around 6 boys many times, repeating the stitches they needed to do next. EAch boy produced a heart. It was a great teaching tool, going from chains to trebles, and incorporated all the stitches for them. Thank you for such a great project! went on in my brain. gifts. The heart ties only took me about 5 minutes each to make. Thank you for sharing your pattern for this heart pin. Such an adorable heart-pattern! Just love it! On my blog I have publiced an swedish translation with a few adjustment at the final round. I made a ring and earrings to myself, I like it a lot! These are great. I have been looking for a little heart to attach to hats and scarves. These are perfect. These are so cute! Thank you so much for the pattern! I'm linking up to your pattern! Thanks so much for sharing! I've made this little heart and have posted a foto on my blog with a link to this site, Thanks for sharing this pattern! These make such sweet little hearts. So quick and easy and everyone loves them. Thanks for sharing. Happy Heart Day! Questions like this are better answered personally, so commenters should include their email address. 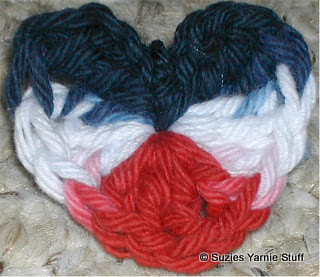 I surfed the internet and tried several crocheted hearts..
been making these for years....before I even had a blog. Thanks again for this pattern, my favorite by far! Thank you for sharing the heart pattern. Plan to use it to applique on squares I'm making for blankets in So. Africa. Also I have some friends with grand-daughters & great-grand-daughters who would probably love these on hair clips. Can think of lots of uses for these. Would be cute on jeans or jeans jackets. Hi. I really like your heart pattern but I have a question. Where do you sl st when finishing off the heart? I did it in the center for the small one but was not sure where to for the large one. The pattern says to sl st in the joining. Not sure where that is. I enjoy your patterns and thank you for your help. Blessings. The final join is back where you started. I actually I no longer join with a slipstitch but use a tapestry needle to join invisibly. I really appreciate your quick reply. Thanks so much. Thanks for your help with this. It is a fun pattern to work. Hi, this is a great pattern and really simple to follow, even though I'm fairly new to crochet! Just made a heart, and ended up with a big hole in the middle (the first ch which I did all of the stitches into.) I'm guessing I did something wrong when finishing, but wondered if you can offer any suggestions as to what that might be? What I do is leave a tail in the beginning and then using a tapestry needle run the tail under all the stitches and pull it tight. That closes any hole. I'm gonna ask a newbie's question even though I have been croceting since I was in my teens and I'm 74 now. You state to start in the first chain. How do you count the chains, staring from the needle or from the end of the chain? Most patterns I have read indicate something like "2nd chain from needle", etc. Since you don't say this, I am interpreting this to mean the first chain made. Is this correct? Yes the first chain made is correct. Suzetta want to thank you for the pattern I make pins for the people I work with I'm a cashier at Walmart .I make pins for them to wear for all holidays and seasons.looking for a pin shape of a person that I can make into a Walmart person with my own tiny crocheted Walmart vest from thread.can you help me with ideas .thanks again peggy8650 from penna. I'm sorry Peggy, I don't have a person pattern. Only thing I can think of is possibly a gingerbread man pattern, slimmed down.